The ferry will drop you back where you started, Cinnabar Island. Don't worry, you can always visit the Sevii Islands again by taking the ferry from Vermillion City, at the same port from where the S.S. Anne sailed away. Now Fly to Viridian City. If you approach the Gym, you'll find out that the old man previously blocking the entrance has moved (only if you have defeated Sabrina's optional gym), and he informs you that the Gym Leader has finally returned. Time to earn your final badge! 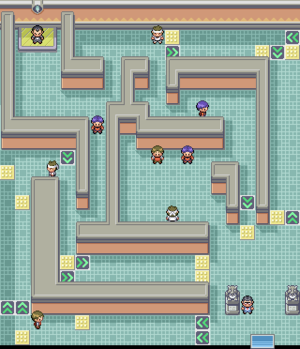 Once you enter, you'll see a small maze filled with Gym trainers. If you look closely, in fact you only need to face two of these trainers to face the Gym Leader, one Cool Trainer and a Black Belt both at the top in the room. Despite this, you should really face them all and get all that delicious XP! The trainers here specialize mostly on Ground Pokemon, and will not shy from using Hyper Potions if necessary. Grind them all into dust with a Water or Grass Pokemon! Once you finish off the trainers, you will face the Gym Leader... It's Giovanni, the villainous leader of Team Rocket! It seems that after you defeated him at Silph Co., he returned to Viridian City to regroup, and is now ready for a rematch with you! Giovanni will no longer call upon his Kangaskhan, and has decided to focus upon his Ground type Pokemon. Expect to face a difficult battle, as they all know Earthquake, and thus will benefit from STAB. Both Nido's have a decent chance to Poison your Pokemon by their Poison Sting move, or through their Poison Point ability. Expect a particularly fast Dugtrio that will be particularly annoying with Mud-Slap, decreasing your accuracy. Both Rhyhorns are slow but can be a threat if they unleash Rock Blast on you. Water Pokemon will work wonders in this battle. Grass Pokemon will be useful against Dugtrio and both Rhyhorns, but Nidoking and Nidoqueen's Poison type will nullify any advantage that Grass types would usually get. Once you defeat Giovanni, he will recognize that he still has a lot to learn, and vows to one day return. He awards you the Earth Badge, which makes all Pokemon obey you regardless of level. He also awards you TM26 Earthquake, the most powerful Ground move in the game. You have finally completed the Gym Challenges! Before you leave, stand on the exact spot where Giovanni once stood, and use Itemfinder. Your final reward for beating Giovanni is the Macho Brace, a held item that will double any EV's that your Pokemon gets from battle, but halves its speed. Your final challenge awaits: The Elite Four!!! From Viridian City, head West into Route 22. You'll run into Blue, who is on his way to challenge the Elite Four himself, and decides to test himself against you. Teach him a lesson! After Blue leaves, continue West and enter the building. The guard within, who blocked your way before, will look at your Boulder Badge, and let you continue. You will find yourself at Route 23. The next guards will look at your Cascade Badge, Thunder Badge, and Rainbow Badge and let you pass through. You'll need to Surf your way up, but you can always take the time to fish around for some more Pokemon if you are missing some. As you Surf up, the next few guards will take a look at your Soul Badge and Marsh Badge, and won't bar your way. Go past the tall grass (another opportunity to pick up some more missing Pokemon) and the final guards will ask for your Volcano Badge and Earth Badge. Enter the cave and continue on with Victory Road! Max Ether (hidden): Near the center of the sandy island. Ultra Ball (hidden): In the wall between two statues north east of the river. Full Restore (hidden): In a boulder that is in the last patch of grass. Max Elixir (hidden): After traveling through Victory Road, in the maze of stones, at a dead end. Leppa Berry (hidden): In a small clearing between the Thunder and Rainbow Badge checkpoints. Aspear Berry (hidden): In a clearing between the rocks before the Volcano Badge checkpoint. Sitrus Berry (hidden): Left of the statue in front of the Victory Road cave hole. Lum Berry (hidden): After traveling through Victory Road, in the maze of stones, at a dead end. This page has been accessed 106,823 times.